Left town on Friday around 1pm and headed North for a weekend of golfing & laughs with another couple. Not even thinking that North in New England this time of year generally means the leaf peepers are out and about; though the colors are not at their peak just yet. The turning of the trees is one of many magical moments in New England; if you have never been here in the fall; you have never really been here. The mountains and the trees are just amazing; we were in the lower White Mountains for the weekend. I have lived here my whole life and I am still in awe when the trees show their colors. Going from green to bright yellow, or red, or orange; really any color in between. When the sun hits them just right ahhhhhhhhh beautiful!!!!! There are very few people that don’t stop and take it all in. We were able to get in 16 holes before the early setting sun made it impossible to find where our balls were landing. Actually kind of funny; my husband landed on the green in two and never saw either hit land. They were great hits, we think! I lost one of my pink balls, which come to think of it was kind of a pain to locate if I hit into the dropped leaves. It didn’t stop me from using them all weekend though. I only truly lost one that was on the 16th hole in the dark; we heard it go through the leaves but could never located it; I even tried looking again when we played the course the next day in the daylight – no luck. I did have a trick up my sleeve for dusk play. A few years back I was lucky enough to stay late with some friends after the womens league I play in. Someone brought out some light up balls – they are SO cool! We kept playing the 18th hole over and over again – Had a blast! I ordered some of them shortly after; I finally got to use them on Friday night to finish out the 16th hole. Very Cool!!! I won’t bore you anymore since this is a foodies blog but I must tell you about my best shot of the weekend. on the 4th hole at Owls Nest course Friday (in the daylight) after taking my ball out of the water I barely rolled into, I chipped a 50 footer into the hole for par; even though I had to take a drop – I think I peaked too early! Just saying – nothing as exciting after that! We got another 18 on Sunday before the rain started; it actually started when we were on the last hole; but we had to finish – too close not too. Arriving home late in the afternoon on Sunday being very chilled chilled even after our 2 hour drive home; it was 59′ out cold raw and damp. I wanted something warm yummy and quick! I had some beets that I had picked from my garden before we left; and even though my husband planted enough potatoes for an army; he hasn’t picked them yet; We always have potatoes in the house, so I picked some thyme from the garden and made roasted thyme potatoes, sliced up the beets and boiled them and Cider Honey Glazed Chicken thighs. Sorry the picture isn’t very good quality; I took it with my phone, pretty tired but I wanted to share this because it was delicious!!! rub the chicken with the oil and the salt and pepper, place thighs skin side up, place in the oven and bake for about 20-30 minutes; they will be lightly browned and done through – you can double check with a meat thermometer (not near the bone) it should read 165′ F.
While cooking place the cider and honey in a small saucepan and bring to a boil, reduce heat and simmer vigorously until the mixture has reduced by half. remove from heat and wisk in the butter. 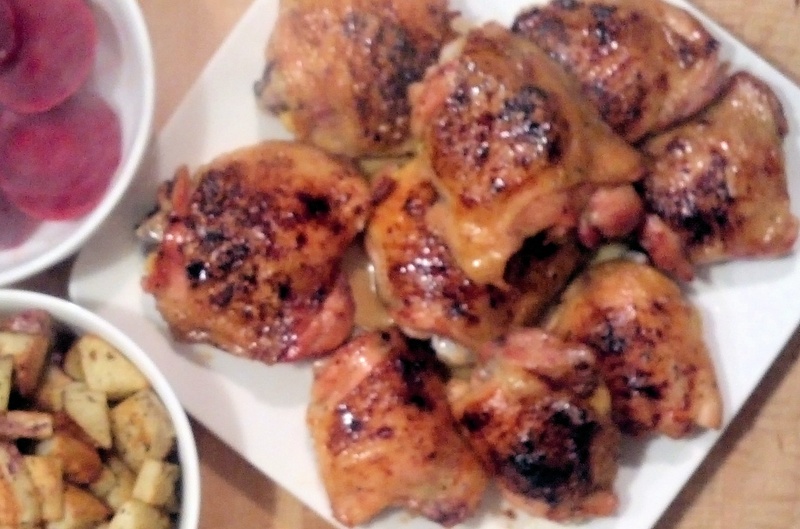 Turn to broiler; brush the chicken with the cider glaze and broil for a minute or two, brush with more glaze, broil again until deep golden brown, 2-3 minutes. Remove chicken brush with more of the glaze and serve. Both pictures look great on my phone; they do not transfer well – I will use my camera from now on!!! It was great thanks! 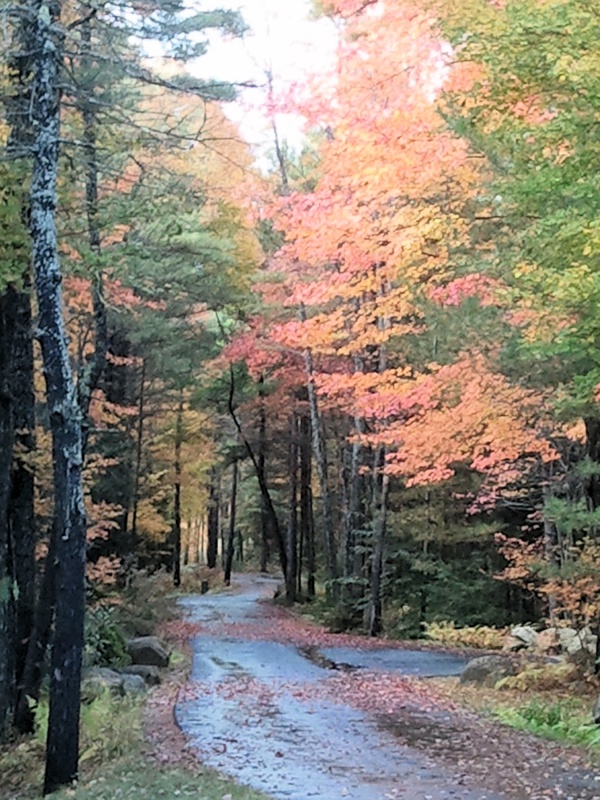 NH is truly a beautiful state and Fall is one of my favorite times of the year!